Before the day is over, we just wanted to say Happy Halloween! For our party, we, along with three other couples, made the chili and everyone else brought sides, drinks, desserts, etc. It worked out well! And thankfully we had more than enough chili... there was 50+ people!! Cute baby and Momma's latest project! 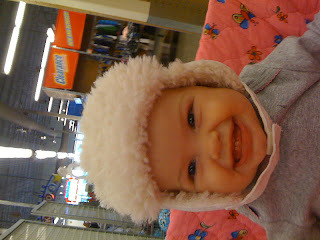 Check out this sweet little winter hat I got for Lilleigh! Quite the deal at Old Navy. And check out this awesome idea for living room decor. Using an old pallet! I had Brendon bring me home one from his work warehouse. So I need to sand and stain it. Possibly reconfigure ours a bit... It looks slightly different. Oh and it's HEAVY! So Brendon has a fun job cut out for himself... finding the studs and anchoring this baby down! But so creative, right?? PS Thanks for your sweet comments yesterday. We are hanging in there. Trying to love our sweet friends well. I've been a little MIA in blog land. I guess I don't know how much to share or where to even begin. I'll say this - I wasn't prepared for the curve ball life has thrown this week. Sometimes life is just hard. I know it's through trials that God strengthens us the most. But it's really hard to be thankful for them in the midst of them. I'll share more in weeks to come. For now, check out this video. The music video part is kinda lame, but the song is beautiful - too beautiful for me to just write out the lyrics. It needs to be heard. Close your eyes and listen to the truths in this song. Lil loooves to play peek-a-boo! Worth watching. Well, I'm biased. Oh and an update... On Friday I was all set to begin Lilleigh boot camp tonight (since my mom was here over the weekend), but Lilleigh decided to go back to sleeping through the night on her own Friday and Saturday! Phew! Thank you, Lord! Praise Him. 1. Lilleigh - She is doing MUCH better! Yea! 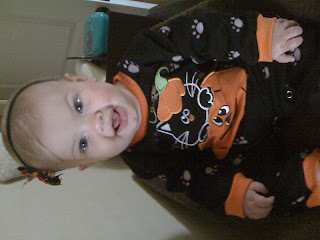 Her fever broke Tuesday night, and she's been oh so happy ever since! Yea! Her runny nose is lingering, but we can manage that. Meanwhile, I got sick Wednesday night (on top of the cold I already had), but after some elderberry Brendon picked up at Sprouts, I've been feeling much better! And today my cold seems to almost be gone! ...Just in time for Brendon to get a cold. Ugh! No one told me how much sickness comes with having a baby! They get something from other babies, and then it spread through the house like wildfire! Pretty crazy. Brendon's mom's best friend, Margaret, lives up here in Dallas. And she invited Lilleigh and me to go to the arboretum with her! This time of year is such a fun time to go too! The weather is cool and BEAUTIFUL! And there are pumpkins everywhere! Definitely a sight to see! We loved walking around and taking pics in the pumpkins! And a little update on my Pumpkin... her eyes are looking better! A friend commented on my blog post from yesterday saying that you can use breastmilk as eye drops to cure pink eye! How crazy is that? Don't worry - I did google it before trying it, and it's true. So we start her on al naturale (and free, I might add) eye drops, and her eyes look SO MUCH BETTER today! Amazing how God provides such natural medicine! A little update on life! Titi and Aunt Momo visit! Lilleigh's "Titi" and Aunt Morgan ("Momo") visited early last week. 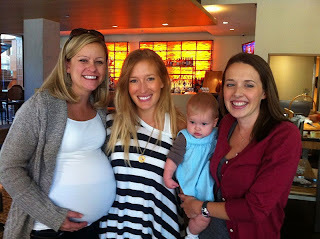 It was a fun time for both all of us, but especially Lilleigh and Morgan! I can't believe it's already been 8 months!! Every age has truly been better than the last. My dad has asked where the 8 month pics of Lil are. I know other family members are wondering too. I used to be so prompt about this. But then my iPhone broke. Wah. So I've been using my sister's old 3G, which quite a bit slower than my old 3GS. Hence I don't snap the photos in time... well usually it just takes too long for the camera to open up, so I don't try. So that's one hindrance. Just a minor one though because my contract is up on November 4th, my birthday anyway. So I'm just deciding if I want an iPhone 4 or 4S... I'd love your thoughts! We've been enjoying the cool mornings around here! 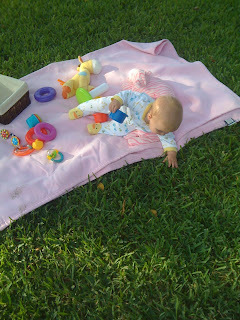 Lilleigh played out in the backyard the other day while I weeded. (Fun times!) Sadly, she noticed that our grass is not as soft and plush as that she experienced in Colorado. She doesn't seem to mind though. We found our first egg!